After we moved in together in October 1990, Diane – who was and is far less of a TV fanatic than me – suggested that we watch The Wonder Years, a show I’d never seen due to the quirks of working retail (i.e., nights) for much of its first two seasons. And, too, I just assumed it was your standard-issue sitcom. But Diane persisted and I eventually relented, if only to humor her – and immediately fell in love with the series. Its evocation of suburban teen life was letter perfect. Anyway, flash forward 27 years and we’re again watching The Wonder Years, and again it’s thanks to Diane – she gave me the DVD set for my birthday in July. Since, we’ve slowly been working our way through the seasons. In my opinion, it’s retained all of its charms and lost none of its luster. 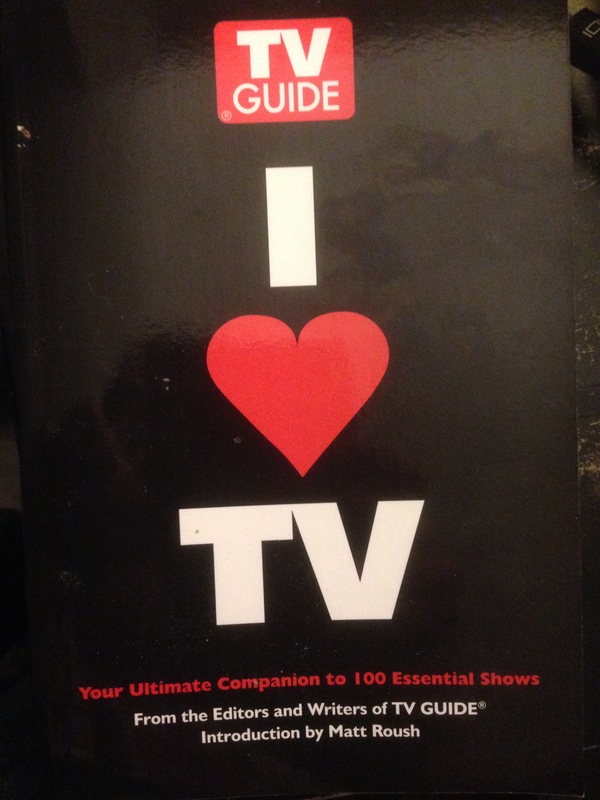 Which leads to this: the first draft of the first essay I penned for TV GUIDE’s I Heart TV tome, which was published by Sasquatch Press in 2007. 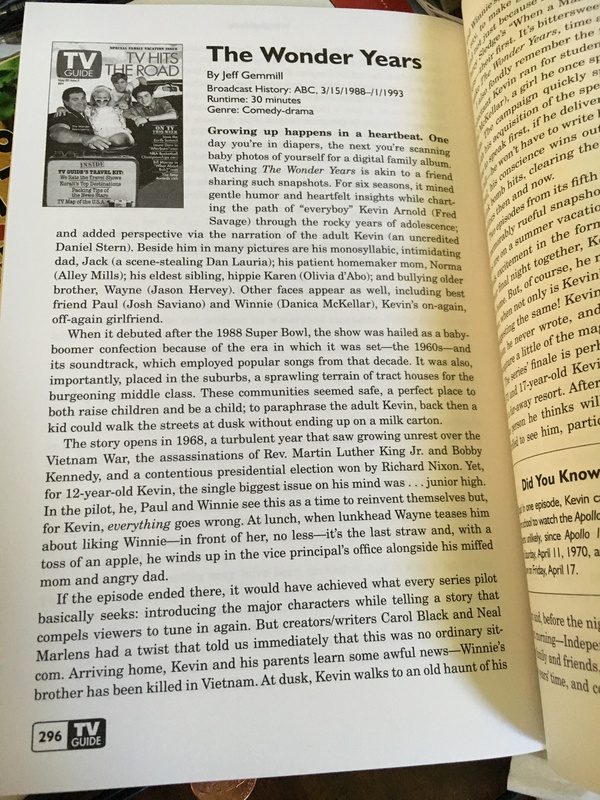 (I also wrote about The Daily Show, My So-Called Life and The Tonight Show Starring Johnny Carson). At the time, I should mention, I was knee-deep in a years-long effort to digitalize old family pictures and movies. Importing the analogue past into the digital present was a time-consuming endeavor for me back then (and, in many respects, remains so). Growing up happens in a heartbeat. One day you’re in diapers, the next you’re scanning family pictures for a digital photo album. In one respect, it’s a tedious task. In another, however, it’s an exercise guaranteed to affect all but the hard-hearted. Memories come rushing in—and not just of the holidays, birthdays and other life events. 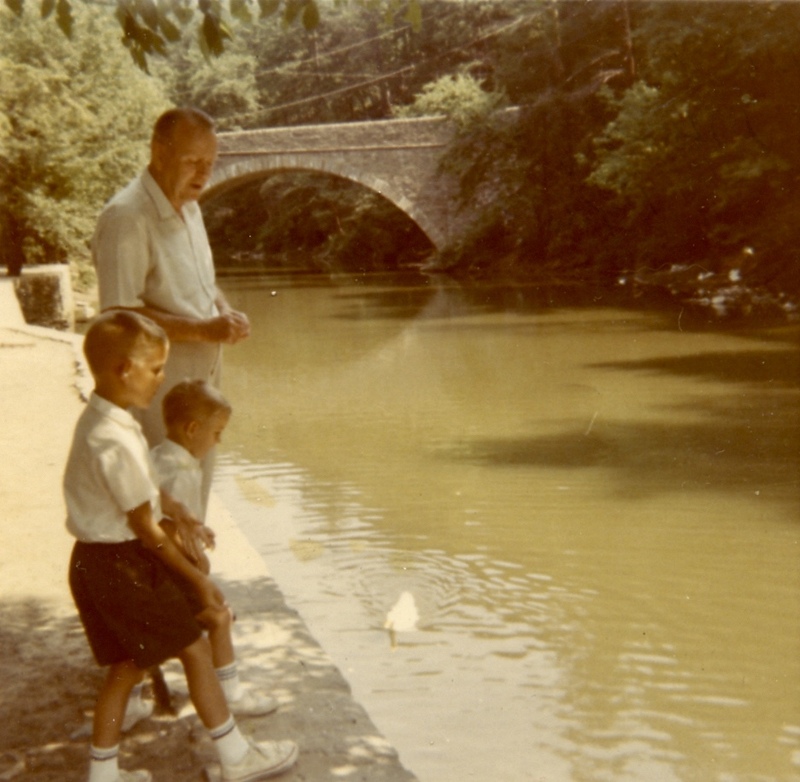 Perhaps a shot of a gray-haired grandfather, his shoulders thrust back and squared to the camera—in uniform despite his casual attire—conjures a duck-feeding expedition you and your brother, just three and five at the time, accompanied him on. And maybe, then, you come across a picture of the expedition itself. You don’t remember much due to your age, of course, yet you recall the kindness of his touch, and the way his giant hand grazed your hair while stewarding you towards the friendly—and hungry—ducks. More than any series (or movie, for that matter), The Wonder Years conveys that very wistfulness—it’s as likely to leave you smiling as it is tearing up. Through six seasons, it charted the path of “everyboy” Kevin Arnold (Fred Savage) as he navigated the rocky terrain of adolescence; and added perspective to the stories via the narration of the adult Kevin (Daniel Stern). When it first debuted, in 1988, the series was hailed as a baby-boomer confection due to the era in which it was set—the 1960s—and its soundtrack, which made generous use of pop, rock and soul songs from those years. It also was, importantly, placed in the suburbs, a land of tract houses and shopping malls that many middle-class families called home. The cookie-cutter communities seemed safe, a perfect place to both raise kids and to be a kid; to paraphrase the adult Kevin, back then, a kid could walk the streets at dusk without ending up on a milk carton. The story begins in 1968, a tumultuous year by anyone’s standards: growing unrest over America’s involvement in Vietnam, the assassinations of Martin Luther King Jr. and Bobby Kennedy, riots at the Democratic National Convention and a contentious general election that saw Richard Nixon win the presidency by less than 500,000 votes. Yet, for 12-year-old Kevin, the biggest issue on his mind that fall was…junior high. In the pilot, he and best friend Paul (Josh Saviano), and the newly pigtail- and glasses-free Winnie (Danica McKellar)—or “Gwendolyn,” as she informs the boys she now wants to be called—see the step up as an opportunity to break free of old perceptions and reinvent themselves. Unfortunately for Kevin, nothing goes as planned. For one, he’s following in the footsteps of his obnoxious older brother Wayne (Jason Hervey), whose boorishness has earmarked his sibling for extra scrutiny at school. For two, well, have I mentioned Wayne? The lunkhead teases him at lunch about liking Winnie—in front of the pretty brunette, no less—and, with a toss of an apple, Kevin winds up in the vice-principal’s office with his Doris Day-like mom (Alley Mills) and monosyllabic dad (Dan Lauria). If the episode ended there, with the adult Kevin pontificating about lessons learned, or unlearned, it would have achieved the goals every premiere strives for—introducing the characters while telling a story that compels viewers to tune in again. Creators/writers Carol Black and Neal Marlens, however, push the debut into greatness: arriving home, Kevin and his parents are met by Wayne and sister Karen (Olivia d’Abo) with awful news: Winnie’s brother Brian has been killed in Vietnam. Suddenly, the day’s events seem meaningless. At dusk, Kevin walks to an old haunt of his and Winnie’s, and finds her looking up at the stars. There’s so much he wants to say, to make go away, but he can’t manage much more than “I’m sorry,” and not just because he’s a kid. Words of those sorts don’t come easy, ever. He wraps his coat around her and, as Percy Sledge’s “When a Man Loves a Woman” swoops in, they kiss—their first. It’s bittersweet, to be sure, but it’s exactly such moments that make The Wonder Years, time and again throughout its run, hit home. In fact, on the strength of that episode and the five that followed in its first, truncated tease of a season, the series garnered an Emmy Award for Best Comedy Series. It earned three more nominations in the years to come, including two once Bob Brush assumed creative control. True, sometimes the episodes missed the mark—the obligatory pimple episode, for example, or when Kevin joined the soccer team—but when they did? They were powerful, funny and dramatic, and resonated long after the credits rolled. Two episodes from the fifth year, when Kevin sprouts into a headstrong young adult, rate among the series’ best. In “The Lake,” the season opener, Kevin’s and Paul’s families are on a summer vacation beside a nondescript lake; and the boys are, in a word, bored. Soon enough, however, Kevin finds excitement in the form of the sultriest 15 year old to ever grace the small screen: Cara (Lisa Gerber), a townie he encounters at a drive-in. On the final night of the vacation, Kevin defies his dad to spend it with her, expressing his wish to stay and vowing to write her; and she holds his hand on her heart. “Back to the Lake,” the second-to-last episode of the season, takes place the following summer, when everyone else and their brother—meaning Wayne—are gainfully employed. Not only is his dad insisting he get a job, but Winnie’s suggesting the same! Kevin remembers the fun he had with Cara, whom he never wrote, and in a rash moment heads back to the lake to recapture a little of the glory…but it’s not meant to be. In a wink of a young girl’s eye, that moment passed him by. The series’ finale is as wonderful and wistful as the premiere. It’s the summer of 1973 and a 17-year-old Kevin is working for his father while Winnie’s a lifeguard at a far-away resort. After one run-in too many with his dad, he quits and seeks out the one person he thinks will make everything okay. But Winnie’s not thrilled to see him, and even less thrilled when he becomes a busboy at the resort. The situation turns worse when he sees her kissing another boy (in a deft touch, “When a Man Loves a Woman” again swells in the background). He hits the road as a hitchhiker, having lost his car in a poker game, and finds himself sharing a backseat with none other than his erstwhile girlfriend. They argue; and are quickly deposited by the roadside as a result. When a rainstorm hits, they seek shelter in a barn—and, before the night’s out, in each other’s arms. The memories stay with us, indeed. As our eyes open to the world, we question our parents about their seemingly arbitrary rules, and bicker with friends, pushing them away one day only to hold them close the next. Expectations rarely play out as envisioned, not because we reach for the sky—though sometimes we do—but because life is not connect-the-dots, where A leads to B leads to C. Even in this age of cell-phones and the Internet, somewhere a gray-haired man takes his grandkids to a park; a 12-year-old boy comforts a friend over a brother’s senseless death; and teenagers defy their parents, often without understanding why. In artful fashion, The Wonder Years articulates all of that, plus this: the day will come when those kids, too, will look back with wonder.